Home / frontnfl / Top 32 NFL Franchise Players: Who Would You Build Your Team Around? After the 49ers signed their franchise player to the richest contract in NFL history yesterday when they inked quarterback Jimmy Garoppolo to a five-year, $137.5 million deal, I thought it was a good time to finalize something I’ve been thinking about: If there was a re-draft of the NFL, who would be the top 32 players selected? This is all about franchise players to build around, so it should come as no surprise that quarterbacks take up 19 of the 32 slots. Keep in mind, these are my opinions, and many people will have totally different takes. But I didn’t just put this list together without giving it a lot of thought; and while I’m not an expert, I do actually watch these guys play a lot. I wouldn’t be able to do this for any other sport, and I don’t presume to know everything about every sport out there like some of the talking heads on three- and four-letter networks. If you have any thoughts of your own or want to ask me for more of my thoughts on certain components of the list, I will be responding in the comment section below. Yes, Tom Brady is 40 years old, but he has defied Father Time unlike any other player in the history of sports. Not only has Brady remained great as he has aged, but he has continuously progressed because he works at it each and every day—the proof is right there on the field. TB12 wants to play at least a couple more seasons (though it might come down to how soon he gets one or two more titles), and there is no reason to doubt he’ll do it. Passing on Brady for your quarterback would be like passing on Michael Jordan in 1996. Brady will set the tone for the entire organization unlike anyone, and there is no better chance to make and win the Super Bowl than with him under center. Bottom line: Tom Brady probably has a stronger commitment to football than any player in the history of sports, and there is no player I would rather have leading a franchise. His 2017 season was derailed by injury, and Aaron Rodgers is now surprisingly 34 and seems to be on the back half of his career, but the two-time league MVP wants to take a page from his friend Tom Brady’s book and play well into his 40s. Rodgers is simply amazing, as he makes the spectacular look easy, with the ability to make huge plays down the field while taking care of the football as well as anyone in the league. He hasn’t thrown double-digit interceptions since 2010, and his 4.01 career touchdown-to-interception ratio might never be touched by another quarterback. And while Rodgers might be the most-gifted quarterback of all-time, he also has an underrated football mind that he doesn’t get credit for because of some of the “wow” plays he makes. Bottom line: Aaron Rodgers is an all-time great quarterback that can carry teams to wins while avoiding mistakes, and he should have at least another five top-notch years left. Some will argue the sample size for Jimmy Garoppolo is too small to crown him as an elite franchise quarterback, but Bill Belichick, John Lynch, and Kyle Shanahan all believe he is that type of player, and this list is about projecting into the future. Garoppolo had the benefit of sitting behind Tom Brady for three-plus years, and it’s clear he took a lot from the G.O.A.T.—from his warmups, to his mannerisms, to his calmness in the pocket. Jimmy G is 7-0 as a starting quarterback in the NFL, including 5-0 with a Niners team that was 1-10 before he took over, and that’s not just some fluke. It would not be surprising to see Garoppolo have a similar career to Aaron Rodgers, who also had to sit and wait his turn behind a Hall of Fame quarterback. Bottom line: There are not many players that people around the NFL would rather start their franchise with than Jimmy Garoppolo. Russell Wilson is under 30 (he will turn 30 in late November), already has a Super Bowl title, and he was the catalyst for Seattle developing into an elite team in the NFC. I do not agree with the arguments that the running game and defense carried Wilson to a championship, and he’s shown that he can carry an offense without a ton of help. The under-six-foot quarterback has had to scramble around and make amazing plays a lot over the years, but if you give him time behind the offensive line he can absolutely pick your defense apart. Wilson’s presence on offense allows a team to build on the defensive side of the ball with the peace of mind of the offense being fine. Bottom line: While not a prototypical quarterback, Russell Wilson is a blue-chip player to build a team around. Last year, I wrote about why I thought Marcus Mariota is the next truly great NFL quarterback in the class of Tom Brady and Aaron Rodgers, and I’m not going to change my opinion after one subpar year in which he dealt with injuries throughout. Mariota has ideal size, a lightning quick release, pinpoint accuracy, and superb athleticism to go along with excellent demeanor as the leader of a football team. Also, his former college coach, Chip Kelly, said he “thinks like a Peyton Manning,” so Mariota should have no problem playing at a high level even if his athletic ability diminishes when he gets older—which he showed he can do when limited to the pocket against the Colts in October. At the end of this season with the Titans up against it, Mariota basically put the team on his back and led them to the Divisional Round of the playoffs. Mariota will be entering his fifth season this year, and he won’t even turn 25 until this fall. Bottom line: Marcus Mariota has the unique ability and upside as someone that has sub-4.5 speed but can win games from the pocket. If not for his shoulder issues, Andrew Luck would probably be higher on the list, and a lot of people might have forgotten how good the quarterback is after he missed the entire 2017 season. The comeback Luck led against the Chiefs in the January 2014 Wild Card Round win, when the Colts were down 38-10 in the third quarter, is evidence of the former number one pick being able to put the team on his shoulders. Luck will operate any offense at a supremely high level, and his presence alone can uplift an entire roster to play better. Bottom line: Andrew Luck might have been considered the best player in the NFL to build around until his shoulder issue. Ahead of the 2017 NFL Draft, I made it clear Deshaun Watson was the best player available in my opinion, and it was shocking NFL teams apparently didn’t feel the same. 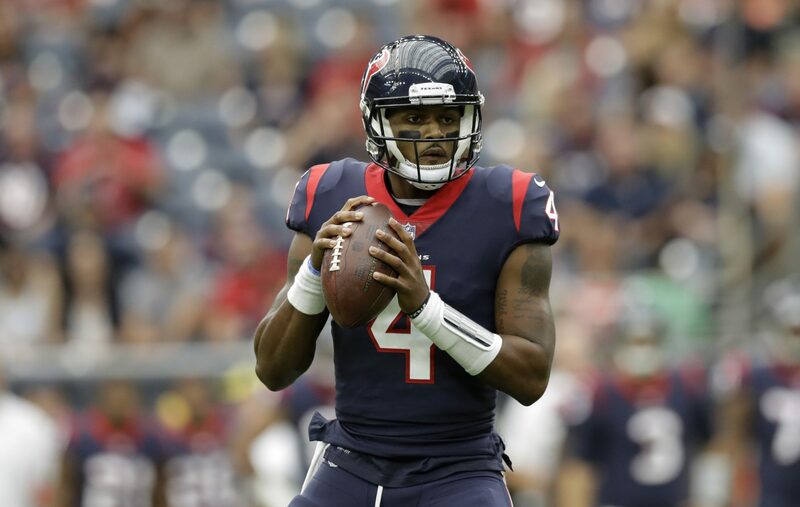 Though his rookie year was cut short by an ACL injury suffered in an early November practice, Watson showed why teams will likely regret passing on him in the draft, as he totaled a whopping 21 touchdowns in just seven games (six starts). The former national champion at Clemson makes a ton of athletic plays, but he also works at the cerebral part of the game and doesn’t just rely on his natural ability. Watson is simply a winner that has the “it” factor, and even as a youngster, there aren’t many better quarterbacks to have in a two-minute drill than him. I am not a fan of his kneeling during the National Anthem after Texans owner Bob McNair’s comments, but it seems to be a one-time thing where he might have been pressured to do it by his teammates, as basically the entire team kneeled. Bottom line: Deshaun Watson is a player that can change a program and make it into a winner. I was admittedly not extremely high on Carson Wentz heading into the 2016 NFL Draft, partly because I was not sure he would make the wild plays he made a North Dakota State in the NFL. However, I had no idea he has a photographic memory, which is a huge asset for anyone in any profession—and in football, especially for a quarterback. Before his 2017 season was cut short, Wentz played unbelievably well, spreading the ball to his many weapons by making accurate throws while also making crazy athletic plays to pick up huge chunk yardage with his feet and through the air. There are times when his accuracy gets away from him a bit, and Super Bowl LII MVP Nick Foles played just as well in Doug Pederson’s offense, but Wentz is still someone most people would love to build around. Bottom Line: Carson Wentz is one of the smartest quarterbacks in the NFL and also has exceptional athleticism and tools. In 2017, Jared Goff showed why the Rams picked him first in the 2016 NFL Draft, silencing all the doubters that foolishly called him a bust after seven games. He came into the league as a 21-year-old and still has plenty of room to grow as a quarterback, but Goff has shown he can operate one of the NFL’s best offenses in his second season. There is no question the former Cal quarterback can absolutely spin the football, and he has as much potential as any young quarterback in the NFL as a passer. Bottom line: Jared Goff has the passing ability to lead the league in passing if the offense calls for him to do that. This might have been the toughest ranking, as Matt Ryan could have been above some of these young gunslingers and closer to the top five as a former league MVP that has played in a multitude of different offenses and won a lot of games for the Falcons over the years. While he has prototypical size at 6’4” and is precise from the pocket, Ryan’s athleticism is very underrated and allows him to make big plays down the field. If the game is on the line, Matty Ice typically lives up to his nickname and comes up clutch for his team. Ryan is a true franchise quarterback that should have another six or seven years good years left in his career. Bottom line: Matt Ryan is one of the most clutch quarterbacks in the NFL, and he gives the consistency desired from a franchise player. Clutch play is a huge part of Matthew Stafford’s game, as he has at least a few game-winning drives each year, including an NFL-record eight of them in 2016 which was the reason Detroit made the postseason. Stafford has completed at least 65% of his passes over the last three seasons, showing the man with perhaps the strongest arm in the NFL plays within the offense but can jump into a two-minute drill with the game on the line and make the plays needed to win pull out a victory. Also, the ability of Stafford to change his arm angle and make different types of throws to fit the ball into tight areas and past defenders is unmatched. Hall of Famer Troy Aikman said Stafford is a top-five, if not top-three, quarterback in the NFL, and he’s up here on this list as the fourth-highest quarterback over 30 years old. Bottom line: Matthew Stafford can accurately get the ball out to receivers no matter where they are on the field. Jon Gruden came back into coaching to join a team led by Derek Carr, so this ranking might be too low considering Gruden spends more time watching tape than maybe anyone and has stated he wouldn’t come back without a franchise quarterback. Carr will turn only 27 in March, and he’s already had an MVP-caliber season in 2016 before it was ended by a broken leg. The first year back from the broken leg, along with the fracture in his back, likely caused Carr some major issues during the 2017 season as he attempted to battle through it, and there’s no question he’s one of the best quarterbacks in the league. Carr could certainly be closer to the top five, and I would be happy with him leading my franchise. Bottom line: Derek Carr has the pedigree, ability, attitude, and track record to make him a great franchise quarterback. The first non-quarterback is linebacker Luke Kuechly, who gets his defense in a better position than anyone in the NFL and can call out offensive plays like he was in the other team’s meeting during the week. Kuechly is the perfect player to counter the great quarterbacks on offense, and he probably puts in as much tape study as any defender in the league. 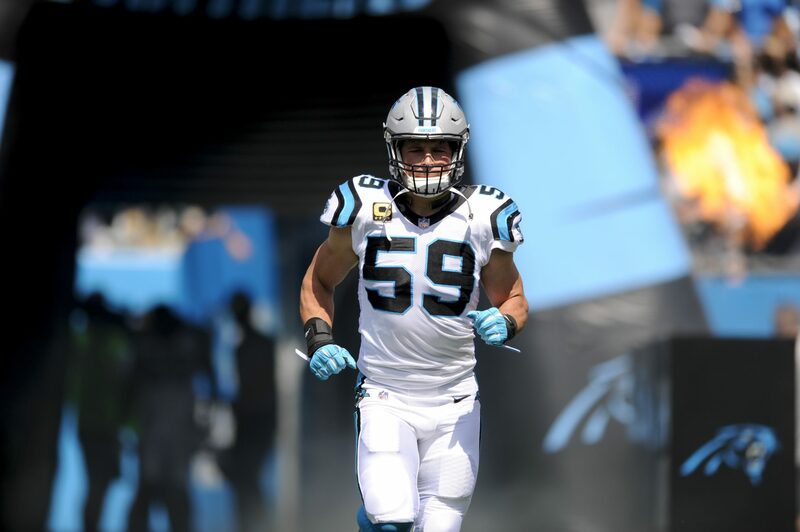 The competitiveness of Kuechly is evident if you watch him play, as it’s obvious how much he wants to win—especially on plays that are near stops to get his unit off the field. Unfortunately, Kuechly has dealt with some concussions, but he’s still only going to be 27 at the start of next season and is a potential stalwart on defense for the next decade. Bottom line: Luke Kuechly is a true defensive anchor that will put the defense in a position to make plays as well as make plays himself. A pass rusher is probably the most important area to target on defense when building a team, but cornerback is right up there with it. Having Xavier Rhodes gives the peace of mind that a number one receiver on an opposing team won’t completely go off on your defense. Personally, I like corners that can press and disrupt routes, which Rhodes can do as well as anyone in the NFL; but he also has the speed to avoid getting beat deep and is one of the best tackling corners in the league, so there are no holes in his game. Bottom line: Xavier Rhodes is a lockdown cornerback that excels in press coverage and is a willing tackler that can help set the tone on defense. The disagreements might really start here, but assuming Bradford is over the knee issue that basically wiped out his 2017 season, he offers the upside of a quintessential pocket passer that can completely torch your defense if you give him time to throw. A stout offensive line would be key in getting the most out of Bradford, but the former Heisman winner and number one pick has everything you look for in a quarterback—accuracy being the most important thing. Bradford is up there with the likes of Tom Brady and Drew Brees in terms of accurately throwing the football, and he clearly has top-five-quarterback ability. Bottom line: There simply are not many quarterbacks that can throw the ball as well as Sam Bradford, who is still only 30 years old. Alex Smith has averaged under six interceptions per year since 2011, and since that time only one quarterback in the NFL has won more games than Smith: Tom Brady. People will argue Smith had Jim Harbaugh and Andy Reid as his coaches, but Smith is the one that played lights out on the field. And aren’t you planning on hiring a good coach like Harbaugh or Reid for your team? Smith will be 34 this offseason, but he’s getting better with age and played like a legitimate MVP candidate in 2017. Contrary to popular belief, and much like Sam Bradford, Smith has a very good deep ball that he unleashed with pinpoint accuracy this season. There is no worry about him losing the game with a mistake, and there’s a good chance a team with Smith at the helm will be in the mix come December and January. Bottom line: Alex Smith avoids mistakes and wins games. There is obvious concern about the health of J.J. Watt and about how much longer he can play in the NFL given that he’s had a few major injuries and major surgeries and appears to almost be breaking down, but his upside is that of an all-time great defender that can ruin a game like no other. Watt has an absurd 69 sacks from 2012-2015 (17.25 sacks per season), and he doesn’t do it as an edge rusher either. There might not be a more unstoppable defensive player in the NFL over the last two decades. He’s also the 2017 Walter Payton Man of the Year and is a first-rate leader of an NFL franchise. Bottom line: J.J. Watt has the work ethic and attitude to lead a defense and an entire team. Statistically, Fletcher Cox might not blow anyone away, but he’s anchored Philadelphia’s defense for years and provides consistency on the defensive line. The Eagles have had a strong run defense for much of the last five seasons, and Cox has been a big reason for the stoutness up front. A big thing I like about Cox is his ability to play in different schemes. Some argue his best fit is in a 4-3 like he is in now, but Cox was arguably better as a two-gap player in a 3-4 defense from 2013-2015, when he both plugged up run holes and racked up more tackles than he does now. Bottom line: Fletcher Cox is versatile and has shown he can be the linchpin of a defensive line in multiple schemes. If Aaron Donald isn’t double teamed, he is going to wreak havoc on an opposing offense as both a run defender and pass rusher. The holdout which resulted in missing Week 1 of the 2017 season is a concern for me because I prefer guys like Tom Brady and Larry Fitzgerald that aren’t going to miss time over a contract dispute, so that takes him down a bit; but Donald is simply too good to not consider one of the 32 players I would like to build my franchise around. Bottom line: Aaron Donald is basically a freak athlete that is too much for most offensive linemen to handle one-on-one. Khalil Mack does not seem like a bad person whatsoever, but I would have to think long and hard about picking someone that sat for the National Anthem before making them one of the faces of a franchise. Not only is it bad for business, but I simply think there are much better and clearer ways to get out a message. Also, the Raiders appeared affected by the whole Anthem controversy this season in my opinion. On the field, Mack has double-digit sacks in each of the last three seasons and has 40.5 through his four years in the league, but he’s not only a pass rusher, and is one of the most consistent edge run defenders out there. Bottom line: Khalil Mack is still in his prime and is on track to become one of the greatest defensive players of all-time. Von Miller is another player that kneeled for the National Anthem, so he is slightly lower than he would otherwise be on the list. I would have to sit down with Miller to get a feel for where he’s at, and he would be off the board if he indicates it might happen again. In terms of production as an edge rusher, it doesn’t get much better than Miller, who was a huge part of Denver’s Super Bowl 50 win and showed he can make game-changing plays when he’s on. Bottom line: Von Miller is a bona fide defensive difference-maker that opposing quarterbacks must be cognizant of on every snap. 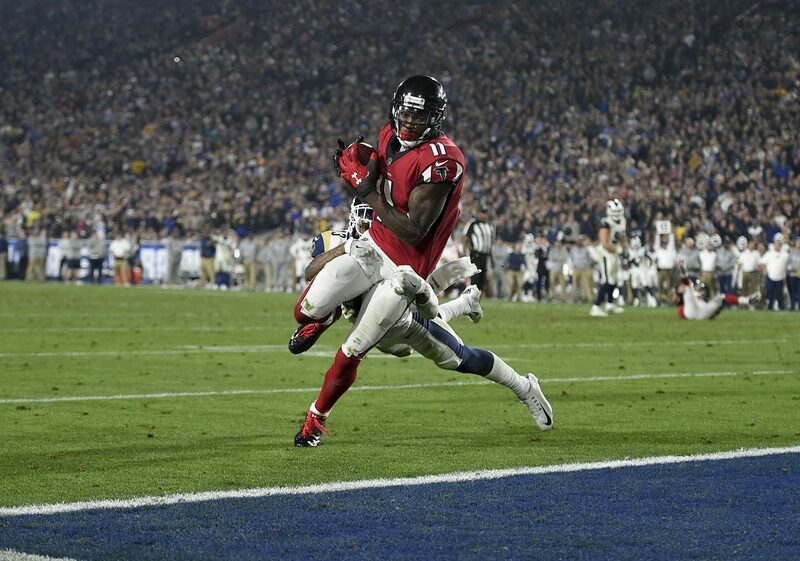 Wide receivers are among the most-replaceable position in football, especially if you have a great quarterback, but Julio Jones is a rare unselfish superstar at the position that can do anything you ask of him on the football field. The All-Pro can run any route you throw at him, he might be the best run-blocking receiver in the league, and he doesn’t make noise when the ball doesn’t come his way. If defenses don’t double Jones, it’s going to be a long day for them, and he’s a big reason the Falcons have won so many games over the years. Bottom line: Julio Jones is one of the greatest wide receivers of all-time, and he’s just as good of a teammate and leader. Again, wide receivers are not necessarily one of the most important position, but Antonio Brown is nearly uncoverable and is smack dab in the middle of his prime, which has gone on for the last five seasons. In those five years, AB is averaging 116.4 receptions, 1,569.6 yards, and 10.4 touchdowns, which made me laugh when I did the math because that is completely insane. Brown breaks the game open and makes clutch plays as well as any player in the league, and he just keeps improving thanks to his epic workout routine that shows the commitment to be great. Bottom line: Antonio Brown strikes fear in opposing defenses and produces every time he steps on the field. The 2014 season was an odd one for Patrick Peterson, who didn’t look or play like himself, but it was revealed he had diabetes and struggled with that. Over the last three seasons, Peterson has been back to looking like his slim and phenomenally-athletic self, performing as an elite cornerback. Because the Cardinals have not made the playoffs in the last two years, Peterson has been under the radar a bit, but he’s still in his prime and among the league’s best. It’s almost a surprise when the three-time All-Pro gets beat by an opposing receiver, which tells you how good he is. Peterson is also one of the best punt returners in the NFL when used there. Bottom line: Patrick Peterson is a game-changer that should remain an elite corner for another five-plus years. This might be the most controversial ranking on the list, and I don’t disagree if you have Newton up in the top-ten. However, I prefer my quarterbacks to win from the pocket, which Newton has certainly shown he can do, but it’s not something he does as consistently as some others. Despite some controversy, Newton appears to be a fine person, but there is no question he’s a bit of a frontrunner and can get sulkier than most when things aren’t going well. Running the football, Newton has both great ability and durability, living up to the nickname of “Superman”, but there are some concerns about how well the titanic quarterback can play when his running skills diminish. I won’t argue if you think Drew Brees should be up in the top ten players to build a franchise around, as he has shown he can still pick apart a defense and just broke Sam Bradford’s record for completion percentage in a season (taking back what was previously his record) while dialing back the passing volume a bit. There is some slight concern with the arm strength of Brees declining, which it appears might have happened in 2017. Of all the players on this list, Brees might offer the least amount of time on the roster, but there aren’t many better people for a young quarterback to sit behind and learn from. Bottom line: Drew Brees is still a top-level quarterback that can light up any defense in any given week. This time last year, Dak Prescott might have been close to the top-ten after his outstanding rookie season in which he played like a ten-year veteran and led the Cowboys to a 13-3 record. And while he went through a rough period in his second season, those stretches happen sometimes, especially for a young quarterback—and he didn’t play quite as bad as the narrative indicated. If given time, Prescott can calmly stand back in the pocket and make strong, accurate throws both inside and outside the numbers, and while he’s not a running quarterback, Prescott can tuck it and run on both scrambles and the zone-read better than most. Bottom line: Dak Prescott is still one of the better young franchise quarterbacks in the NFL, even if he has not shown the ability to completely carry an offense yet. Mitchell Trubisky did not have a ton of experience coming out of North Carolina last year, but his talent and ability was obvious. During his rookie season, Trubisky showed major flashes with his very strong arm and excellent athleticism, playing well in between some rough parts that are completely normal at the start of an NFL career. A real positive about Trubisky’s game is that he has a natural feel for the deep ball and can drop it in the bucket better than a lot of young quarterbacks. Right now, he might best fit in an offense that allows him to use his athleticism on rollouts and maybe a couple of zone reads, but Trubisky should be able to become a true pocket passer. Bottom line: Mitchell Trubisky is a gifted young quarterback that offers a lot of upside as a franchise player. Again, pass rushers might be the most important position in football aside from quarterback (and maybe offensive tackle), and Joey Bosa has entered the NFL with a full arsenal of moves designed to devastate an offense and get to the quarterback. The former Ohio State star already has 23.0 sacks through two seasons, so his career is off to about as good of a start as possible. I do not like the holdout ahead of Bosa’s rookie season last year, but he’s produced as well as you can expect since he’s been on the field. Bottom line: Joey Bosa stepped into the NFL as a star pass rusher and would be a franchise-caliber player even if he does not improve. Tre’Davious White went way too low in the 2017 NFL Draft, and he already looks like an absolute steal after the rookie season he had in Buffalo. Not only did the cornerback from LSU lockdown many opposing receivers, but he had four interceptions and some game-changing plays in the fourth quarter. There might not have been a player that was more important in getting the Bills to the postseason for the first time since 1999 than White, and he’s someone I would want on my team. White is below the six-foot mark at 5’11”, but it’s not a problem given the way he blankets receivers, and he’s also a very good tackler. 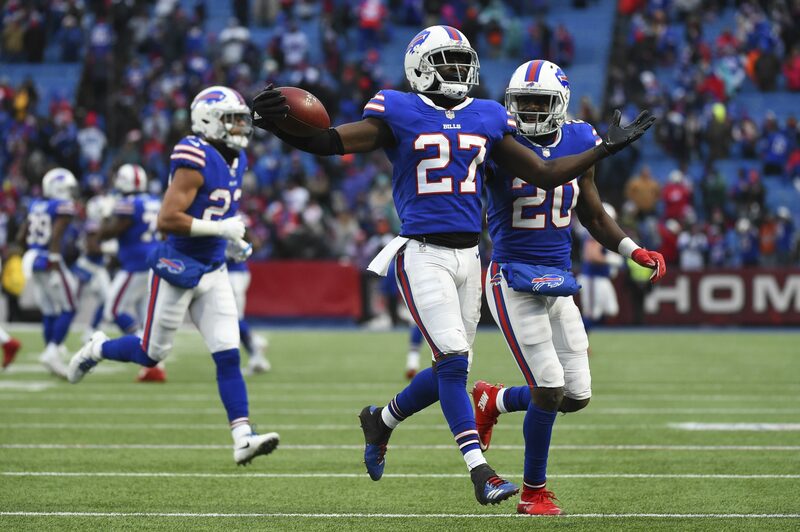 Bottom line: Tre’Davious White is an all-around cornerback that can become a guy capable of being placed on the opposing team’s number one receiver and shutting them down every week. There is not anything not to like about Harrison Smith’s game, as he is an all-around safety that can play in deep coverage as well as come up and help stuff the run. I would get him knowing that he’ll be a leader and help establish a culture on defense of a bunch of guys that play hard. Smith just turned 29, and the 2017 Defensive Player of the Year finalist should have another several years as an All-Pro caliber safety. Bottom line: Harrison Smith is a smart, tough safety that secures solid play from a secondary. I am not a person that overreacts to the latest moment, and that’s not what this is, as Foles also played like a franchise quarterback back in 2013 during his first stint with the Eagles. Foles just showed the world he can lead a team to a Super Bowl victory, and it’s not like it was a fluke. I love the way Foles gives his receivers a chance to make plays, and he’s a really tough quarterback to stop when he’s confident and pulling the trigger on his throws. And as he showed the world in Super Bowl LII, Foles has underrated athleticism that allows him to avoid the rush and make big plays. Bottom line: Surrounded with a strong supporting cast, Nick Foles can more than get the job done. Wow this is pretty awesome. Great idea. This is actually kind of dope. I guess you’re right about Brady just because he gives the best shot at a title. I don’t blame you if he should be number one, but he’s also coming off an injury and Foles played pretty well in that offense too. It’s close between a lot of those guys in that area. I thought about Goff being higher. Campbell could be in there, but he’s a little older than everyone but a couple players there. Zack Martin, Melvin Gordon, Le’Veon Bell, Eric Kendricks, Anthony Barr, and some Jags guys among others that just missed. Ramsey should be in!! And Marshon Lattimore too. They were really close to making it. Ramsey doesn’t tackle well at times. Yeah, if you don’t like winning. You are by far the worst commenter on here. Brady should not be #1 and Rodgers probably shouldn’t be #2. Too old. They both want to play into their 40s. Ask yourself this: Would the Patriots or Packers trade either of them for anything? There’s a story from Jay Glazer about John Lynch asking about Garoppolo (who is number three on this list) and when Belichick said no, Lynch called back said “then what about Brady?” Belichick said “did you really just ask me that?” and said no way lol. Great point about them not trading either of Brady or Rodgers. Some things I disagree with of course but good piece. He has a ton of talent but I don’t like some of his antics. No he isn’t. Watch him play. Why is Julio Jones on there? He’s a complete beast but is also a great teammate an example. Can completely take over a game, as he’s shown through the years. Averages the most receiving yards per game in NFL history. Projecting is a part of this. Not many people can be a smart pocket passer with the ability to run for a 90-yard touchdown like Mariota. And he’s a great person and I like his demeanor. Awesome idea. Think we’ve seen enough from Garoppolo to have him 3? I understand if some don’t think so, but yeah I definitely do. Great to see Rhodes, Smith, and Bradford on there. I hope we keep Sammy at qb. This is really good. Enjoyed reading it. Drew Brees should be higher, Chris Harris should be on it. Fair ranking for Goff. I might have him higher though.